Please take the time to read about their professional background below. Tahani is a certified education & ICT expert in interactive boards and education technology at GIMPEX. She has been training teachers since 2011 and has been in the field of education as a Teacher, teaching “German as a foreign language” since the year 2000. As a principal of a private German language School she was able to develop and gain more management skills for some time. She also used to be a supervisor of the German department in a private school for several years. Tahani obtained her Bachelor degree from the Faculty of Economics & Political Sciences with a major in Statistics in Cairo University and took many pedagogical courses related to education in general. Her organizational skills are an added value to the education consultant team and she is therfore responsible for the training logistics of the team. Tahani can bring her experience and open minded perspective to support our clients in applying their vision and is constantly updating herself in this matter. Tahani’s dream is to assist the reform of education in Egypt. Her main concern is to explore ethics and values to support ICT Integration in education. 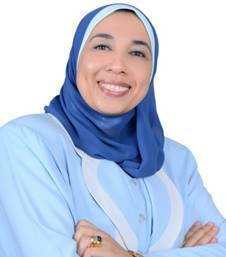 Manar is currently a certified education expert at GIMPEX for education technology. Her recent dual master degree in International Education Management, June 2015, was earned from PH- Ludwigsburg in Germany and Helwan University in Cairo. 2009 she achieved her post graduate studies; German Pedagogy Diploma, by the faculty of Education, Helwan University, Cairo. Her experience in Germany, in several governmental projects, was as staff consultant for ‘ausblick-Hamburg GmbH’ , a job coach & Educational Specialist for ”BASIC’- Mikro Partner GmbH” which support the integration, personal & practical competencies and education process of multinational refugee-groups. She is also the HR Manager for ”rafikee online tutoring” one of Gimpex educational projects, which is an online platform concerned with the academic international education systems. She studied Educational Management and Leadership & Change Management, specified in Human Resource Management in PH-Ludwigsburg,Germany and designed her own course in HRM that should be delivered to the managers and decision makers. Now she is in the process of obtaining her SPHRI (Senior Professional HR International) degree. She is a German school graduate DEO and earned her German Language Diploma from München, Germany. Manar has established the German section in Victory College Maadi for both the National and the International/ American devision, with the cooperation of the Ministry of Education and Goethe Institute Cairo. She has enriched her teaching experience through working in multinational & international schools in Egypt, with different systems and variant curricula and extra school activities. She was able to turn her classes and language delivery courses to engaging and student centred performance. Besides, she is also committed to teach the German International Education Program accredited by Goethe Institute for level A1-B1. Iman is a certified education & ICT expert in interactive education technology and has been in the field of Teacher Training since 2010. She is currently the operation manager at Gimpex and supports the team in the planning and the implementation phases by managing and coordinating and monitoring the internal processes of the different projects. Iman is in the process of obtaining her MBA in the field of strategic Management & Business planning from the Royal British College and obtained her Bachelor degree in Biochemistry She also got her diploma in ICT (Information and Communication Technology) in 2009 from the Yarmouk University in Jordan in association with the “INHOLLAND University” in Holland with excellence. Iman has cooperated with the Ministry of Education in Jordan (Intel /Isef), the British Council in Jordan in a project called the ” The Connecting Classroom Program” , also with many international, private and public schools in Egypt, Arab countries and in Africa. Iman worked as a biology teacher at the beginning of her professional life and attended many pedagogical courses applying her experience directly in her classroom with her students. Her professional experience in education was gained through several years of teaching biology and holding the position as an eLearning supervisor in a private school in Jordan. Iman believes in change and in a healthy and harmonized environment, she is therefore an active agent in the Ecoschool program. Marwa is an educational consultant & ICT expert at GIMPEX Learning Technologies. She is currently the R&D manager at Gimpex and is constantly exploring new products and softwares to support the development of the team. Marwa has been working in the teacher training field since 2009, training hundreds of educators in public schools and international schools on the effective pedagogical use of Interactive Boards and integrating technology into teaching and learning. Marwa’s professional experience extends to building a positive culture towards “Digital Citizenship” in Egypt, in order to reach a safe digital landscape where kids, teens and adults can act as good digital citizens. To help achieve this she founded “Netiquette School” as a means of enlightenment and building the right digital awareness. In 2017, she has been recognized as a Digital Citizenship Educator from Common Sense Education. Marwa is passionate about all aspects of Education Technology and very interested in STEAM Education by which she got her Professional Educator Diploma in STEAM Education from the American University in Cairo. In 2008, Marwa received her Bachelor’s Degree in Accounting from Cairo University and graduated with high honors; she also worked for a while in the Egyptian Stock Market. Her passion for education made her change her career path in 2009 to join the Egyptian Ministry of Education as an education technology specialist and later as an ICDL & INTEL Learn Program trainer. Then she obtained her Diploma in E-Learning at the Cairo University in 2011 and started her journey in supporting many Egyptian public schools since then. Marwa believes that technology can be used to fight poverty and lack of resources in those schools, this is why she launched her Project “Poverty will NOT Prevent me from LEARNING” for delivering a high quality education service in public schools using ICT. In 2012, Marwa has been selected as the first SMART Exemplary Educator in Egypt, and she reached the 8th rank globally. In 2013, she became a SMART Certified Education Trainer and software instructor. On the extracurricular activities level, Marwa ensured utilizing her technological knowledge and coaching skills by participating in developing & delivering STEAM learning modules with STEAM Masters’ team at the AUC. – EduVation Summit, talk about “Digital Citizenship” Oct. 7th 2017, Nile University, Cairo, Egypt. Sahar is an Educational quality management Consultant, She earned the Lean Six Sigma green belt certification from the International Association of Six Sigma IASSC and is also a certified internal EFQM assessor from the European Foundation of Quality Management. Sahar is currently working on her Ph.D. in the field of Education technology and quality Management at Helwan University. She already earned her dual master degree in International Education management from Helwan University and PH Ludwigsburg in Germany. In 2012, she achieved her higher diploma in Psychological Measurements from Helwan University and accomplished her studies on the master level in Special Education at Iowa State University, U.S.A. in 2009. In Egypt she made a remarkable input in developing the educational managerial system of one of the Egyptian private schools, and helped in establishing one of the famous international schools in Cairo. Her professional experience in education covers teaching, quality assurance and educational management. She gained her teaching experience through teaching English as a second language for non-native English speakers at Meeker School, U.S.A. As a bachelor degree holder in special needs education, Helwan University, she practiced teaching for special needs students. Sahar was able to enrich her knowledge by taking part in several training courses, such as Change Management & Development Approaches Department, at Eschborn in Germany, and an intensive English and Orientation Program in presentation and discussion skills at Iowa state university in U.S.A. as well. Besides being a certified trainer from Mozaik Education, at GIMPEX, Sahar is responsible for the quality management of her organization and for sustaining the unique level of professional performance for her team. Heba is an Educational consultant with a Ph.D. in Teaching & Learning from Queens Bay University, USA. 2015. Her passion to education drove her to acquire & spread knowledge to empower those around her, whether in the education or the business field. From ‘Launching innovation in schools”, MITx, to “Design Thinking for innovation” University of Virginia. Heba is also a part time instructor in the School of Continuing Education, The American University Cairo in the Math and Science Teacher Training Certificate, and English Language instructor. Her experience in the educational field was gained through working in international schools as a science teacher; where she became SMART Exemplary Model Educator and earned her Teaching English as a Foreign Language Certificate form Notting Hill College, UK in 2010, promoted to head of the science department over the past twelve years. Before that while she was working as a science teacher she earned her Diploma in School Psychology from the Faculty of Education, Suez Canal University, 1997 and in the same time was working on her MBA (Development Focus) from the Arab Academy for Science, Technology and Maritime in 2001. After finishing her master degree, she increased her work with NGOs, Small & Medium Enterprises, became a member in the National Council for Women for 6 years, 2002-2008, working heavily to eradicate illiteracy, especially among women. She was the branch manager to freight forwarding companies, till she decided to establish her own freight forwarding business, and back to teaching in 2005. Because of her diverse history, Heba is the resource manager of GIMPEX Learning Technologies. She is the backbone empowering the team, clients and trainees to excel in their endeavors, using her experience, creativity, and instantaneity to meet their targets. Heba is a firm believer that “Once you stop learning, you start dying” Albert Einstein, lifelong learning is the key to sustaining decent life to all mankind and saving the planet.